The first 10 minutes looked exactly as you would have expected for a Thunder team fresh off a rough loss on the road and now back home with a shot at ending a skid of 4 losses in 5 games. The defense was active and aggressive, forcing 5 turnovers in the first 4 ½ minutes of action. 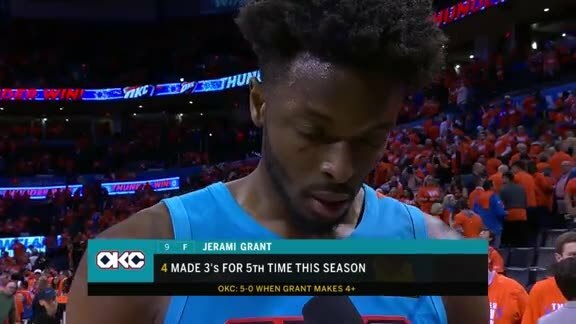 Jerami Grant hustled back to break up a Los Angeles Lakers transition breakaway. On the other end, Russell Westbrook pump faked with 8 seconds left on the shot clock, and instead of taking a contested look, attacked the paint and found Terrance Ferguson for a wide open three. That’s how the first quarter went as the Thunder began on a 16-7 spurt and then ripped off a 12-0 run midway through the period to build up a 17-point lead. “We started the game off really well on both ends of the floor, both offensively and defensively,” said Head Coach Billy Donovan. Surprisingly, that was the Thunder’s biggest lead of the night, and it didn’t last long. As the first quarter came to a close, however, the inklings of a Lakers run started to foment. A couple of buckets came a little too easily, and the Thunder’s offense failed to produce much of anything as Los Angeles closed the quarter with a 6-2 mini burst. As the quarter turned, the spark ignited a full-scale fire. Before the Lakers’ run was done, the Thunder saw its 17-point lead evaporated and by the 6:27 mark of the second quarter was a 5-point Los Angeles lead after a 29-7 run. The damage mostly came at the three-point line, as the Lakers continually got open looks from behind the arc both on catch and shoots and off the dribble. Kyle Kuzma was scorching hot from the three-point line, as the forward who was shooting under 30 percent from three on the season managed to bury 7 threes in the game. Lonzo Ball, also not a high-percentage shooter, knocked down 4 three-pointers as well, and as the game wore on in a back-and-forth fashion through the second, third and fourth quarters, that marksmanship helped open up rolls to the rim for Lakers reserve center Ivica Zubac, who scored 26 points on 12-for-14 shooting. “We have to defend the three-point line at a really, really high level. That’s the whole thing,” Donovan said. Yet despite all of that prolific offense from the Lakers, the Thunder still had a chance in this one because of its own three-point shooting. Donovan’s club set Thunder records with 22 made three’s including 5 apiece for Russell Westbrook and Paul George and 6 for shooting guard Terrance Ferguson. So much was made of the Thunder’s shooting woes earlier in the season. Over the past two weeks, the Thunder seems to have resolved some of those offensive kinks, only to replace them with something much more difficult to overcome - the fundamentals. Tonight the Thunder shot just 12-for-37 (32.4 percent) in the paint and 24-for-36 (66.7 percent) from the free throw line. Westbrook made three super clutch free throws with 2.9 seconds to go to send this one to overtime, but repeatedly in the second half and the extra period, the Thunder point guard and his teammates desperately struggled to not only find shots but make them inside the lane. The Thunder produced just 14 points in the paint after the first 8 minutes of the game. The result was 54 three-point attempts for the Thunder topping the 40 hoisted by the Lakers. Though Los Angeles only missed 21 of those 40, the Thunder took its eye off the ball in one other crucial, fundamental aspect of the game - defensive rebounding. Throughout the night the Lakers snagged 14 offensive boards, resulting in 18 second chance points that helped it dominate the rebounding battle 63-44 and in points in the paint to the tune of 56-24. “Just a little bit of up and down, inconsistency on our part for 48 minutes,” assessed Westbrook. 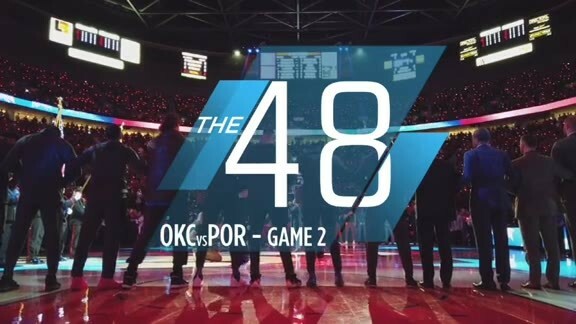 The Thunder was on a tenuous balanced all night, with the wedge of a hot three-point shooting night acting as a wobbly crutch to a lacking defense, missed chances on loose balls and poor simple shot-making, the Thunder’s twine finally snapped in the overtime period. Of the Thunder’s 13 shots in overtime, 12 were three-point attempts, partially as a product of a packed paint by the Lakers in the opening few minutes then out of necessity after the Lakers got a three and a driving layup from Ball and two free throws from Zubac. The Thunder’s back was completely against the wall, and no amount of streaky shooting it had before could make up for it at that late hour.